Eight supporters of the Peoples Democratic Party (PDP) have been confirmed dead in an auto crash which occurred on Friday at Ugbokpo in Apa Local Government Area of Benue State. 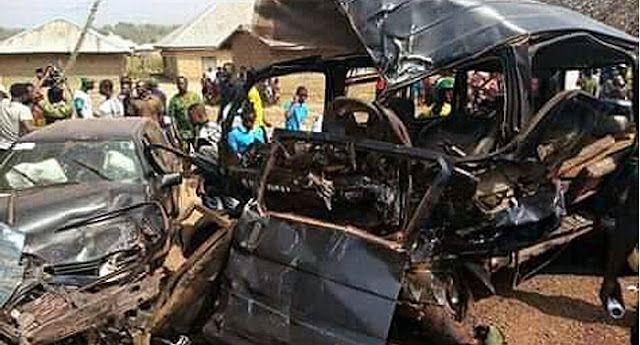 They were travelling to Agatu for the flag-off of the PDP’s Zone C senatorial campaigns when their vehicle was involved in an accident involving two other vehicles. The bodies of those who were certified dead at St. Charles Catholic Hospital Adoka have been moved to the morgue of General Hospital in Otukpo, while the survivors are being treated in Adoka at the time of this report. Benue State Governor Samuel Ortom who visited the hospital in Adoka in company with former Senate President, Senator David Mark, and the Deputy Governor, Engineer Benson Abounu, announced the indefinite postponement of the PDP senatorial campaigns flag-off in Zone C.
The Governor described the incident as painful and unfortunate, saying it is a huge loss to the entire PDP family in the state. Governor Ortom also gave a directive for the immediate evacuation of the survivors to Benue State University Teaching Hospital Makurdi for further treatment, stressing that cases that required further referrals outside the state would be handled accordingly. He condoled with the families of those who lost their lives in the crash. Former Senate President, Senator David Mark who also consoled the affected families, lamented that most of the victims were very promising youths within his senatorial district and prayed God to grant the deceased eternal rest. On his part, the member representing Obi/Oju Federal Constituency, Rt. Hon Samson Okwu, described the incident as painful, saying he met with some of the victims yesterday but never knew they were meeting for the last time.